Web.com—How Do I Print a Copy of My Invoice? 2. 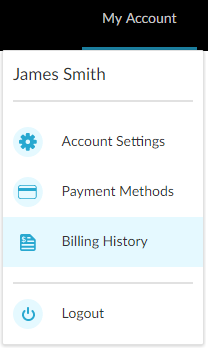 In the upper right-hand corner of the page, hover over My Account, and then select Billing History. 3. Under Billing History, check the invoice that you want to print. To select all invoices, check the Select All check box in the top row. 4. Under the invoices table, click the Print icon. The Print panel appears. Select the appropriate settings. You have printed the invoice(s). Web.com—How Do I Download a Copy of My Invoice?